The Agenda for the Annual General Meeting is now available. Fifteen teams have entered the Park Avenue Open Doubles to be held on 8 July. Kapiti successfully defended the Jacques Cochonnet for the second time in their away match to Upper Hutt. With three consecutive wins, Kapiti have now recorded their longest winning run. Triples: Fay Doyle/Brian Frampton/Annick Le Guen vs. Ian Baine/Jean Baine/Colin Gooch 9–13, 8–13, 13-10. Kapiti's next match is away to Manawatu. Fourteen teams took part in the July edition of the Park Avenue Doubles. David Parr and Tommy Werry (Park Avenue) took first place on tie-break from Michael Rocks and Peter van Heusden (Khandallah). Does Wellington finally have a venue to rival Ponsonby's Atomic Cafe? Auckland's Atomic cafe (since renamed Cafe 121) in Ponsonby Road could be considered the birthplace of Pétanque in New Zealand. For years, those of us South of the Bombay Hills have listened in envy to the stories of Aucklanders who have played pétanque in the alleyway at the back of the cafe. Perhaps now there is a place in Wellington where a game of pétanque and a pastis could become a Sunday afternoon destination. Located at 92 Karori Road, Coucou is open for Dinner Wednesday to Saturday, and Brunch/Lunch Saturday and Sunday. Coffee is by The Immigrant's Son and the food by chef Jerome Touzard is outstanding! Unfortunately, Coucou is no longer trading. Twenty-six teams have entered the Horowhenua Midwinter Triples to be played on Sunday 15 July. Due to a successful year last year, clubs will receive a $3 per member rebate on affiliation fees. Minutes and reports to follow. 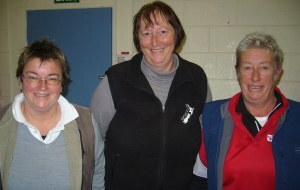 Barbara Johnston, Christine Strichen and Claire Wilson were undefeated in winning the Horowhenua Midwinter Triples on a rather wet and windy day. This was the largest Triples field in the Wellington region for some time. Kapiti held its annual Memorial Mêlée on Sunday 22 July in perfect weather! There were 64 entries which was great considering that, earlier in the week there were only 41. People are creatures of habit. 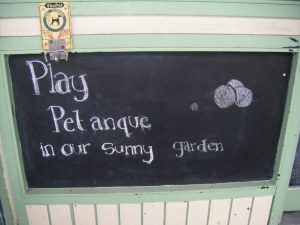 If you asked most players where they play pétanque, they would state their club, or possibly a home piste. However, there are many locations throughout the region where you play the game. A group of intrepid players from the Kapiti area have been travelling around trying out the various public terrains. Rex Hayes sent through some photographs. So the next fine day you feel like a game of pétanque, don't just wander down to the club out of habit, get some friends together and meet at a public terrain. Who knows, you might find someone new to play with. Kapiti have created a new Jacques Cochonnet record by winning three consecutive away matches. In their latest match they travelled to Manawatu. Triples: Max Brown/Fay Doyle/Brian Frampton vs. Ian Bailey/Derek Cooper/Don Thompson 13-4, 13-5, 13-5. Kapiti's next match is away to Masterton. Twenty teams have entered the Park Avenue Open Doubles to be held on 4 August.